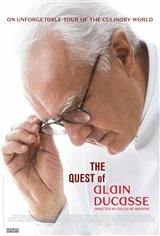 This documentary follows French chef Alain Ducasse, who has opened 23 restaurants worldwide and amassed 18 Michelin stars, as he spends two years touring the world and visiting his own suppliers and restaurants as he prepares to open the very first restaurant in Versailles. He encounters an array of foods and flavors, utilizing his craft and his willingness to try anything in order to discover the best dishes the world has to offer. French director Gilles de Maistre accompanies the chef on his travels from London to New York and Tokyo to Rio and discreetly documents his flavorful journey.